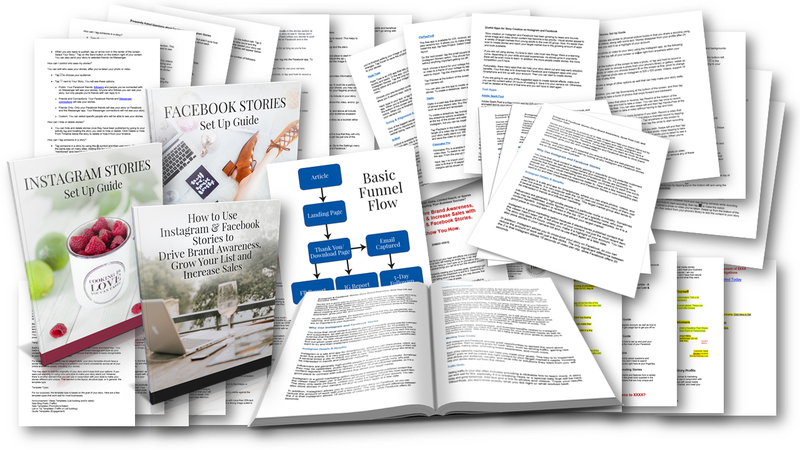 If your customers teach about marketing on social media, this PLR package is a must-have and at 50% off for a massive list building bundle they can brand, monetize and publish…it's a no-brainer for you to promote and for your customers to buy. 50% Coupon Code is valid through Sunday February 10, 2019 at midnight EST. Your customers will be able to pick up a complete list building package that will teach their readers all about expanding their reach and building brand awareness using social media stories. They can use the PLR to teach a course, fill up their autoresponder, turn it into several opt-ins, use it for blog posts or even turn it into a paid product. Tons of possibilities! Instagram & Facebook Stories Drive Brand Awareness, Grow Your List and Increase Sales Report – 4,765 words (.docx): Includes the benefits of social media stories, meeting goals with stories and includes the different types of stories that can be used. Attract More Business With Social Media Stories Article – 1,592 words (.docx): Includes information on how to tell business stories. Useful Mobile Apps for Story Creation Article – 1,559 words (.docx): Includes a list of apps to make story creation easier than ever. 2 Setup Guides (.docx): Step by step guide on creating stories using Instagram and Facebook. Also includes planning and sharing tips for the most success. FAQ Sheet – 1,066 words (.docx): Includes the most frequently asked questions about Facebook and Instagram Stories. 5 Follow Up Emails (.docx): Autoresponder series about Facebook and Instagram stories including more tips and strategies. Landing Page & Thank You Page (.docx): Making it easy to get the content out there and start list building. 3 Professionally-Designed Ecover Sets: .JPG and .PSD with flat cover and 4 x 3D versions to go with each the report and setup guides. Video Setup Guide (.pdf): Instructions on how to upload the video to YouTube and embed into website. Snapchat Setup Guide (.docx): Step by step guide on using Snapchat and Snapchat stories. Also includes hints and tips for the most success. Canva Setup Guide (.docx): Step by step guide on how to use Canva to create stories. Resource Guide (.docx): Detailed explanation on how to create engaging stories your audience will love. 3 Articles (.docx): Includes best practices and benefits for Snapchat, Instagram and Facebook. Ideas Sheet & Sample Story Ideas (.docx): Includes ideas to use for social media stories that any audience will resonate with. Also a sample list of 3 multi-image stories to use. Tools & Apps List (.docx): A comprehensive list of tools and apps to use for creating social media stories. Marketing Tips (not PLR): A list of social media marketing tips. Multi-Image Story Templates (.potx and .psd): Includes 3 multi-image story templates created in both PowerPoint and Photoshop. Single-Image Story Templates (.psd and .png): Includes 13 story templates. Those who purchase the upsell will also receive a chance to get 24 download credits to get 24 regularly priced products (valued at $27 each) for just $77 (saving them $571). Their download credits never expire and can be used all at once or whenever they're ready. Your affiliate link: https://www.diyplr.com/bundles/aff/go/XXXX/?i=394 – IMPORTANT: Replace the XXXX with your affiliate ID. Not sure what your ID is? Log in here. IMPORTANT! Don’t send emails until 10 AM EST on Wednesday, June 13th. Your affiliate link will not work before then and the sales page will not be live. If you teach your readers about social media marketing and you're looking for ways to grow yours at the same time, you'll want to check this out. Here's a massive content package for you, complete with private label rights, your future subscribers will love. It comes from one of my favorite PLR providers, Alice Seba from List Magnets…but it's on for a very special price for a short time only. Instagram & Facebook Stories Drive Brand Awareness, Grow Your List and Increase Sales Report – 4,765 words (.docx): Includes the benefits of social media stories, meeting goals with stories and includes ideas for the different types of stories that can be used. Useful Mobile Apps for Story Creation Article – 1,559 words (.docx): Includes a list of apps to make story creation easier than ever for your readers. FAQ Sheet – 1,066 words (.docx): Includes the most frequently asked questions about Facebook and Instagram Stories to educate your readers. 5 Follow Up Emails (.docx): Autoresponder series about Facebook and Instagram stories including more tips and strategies to position yourself as the expert. Marketing Funnel Diagram (not PLR): Gives a good visual of how to set up the marketing funnel. And like I said you can grab it all at one low price, but for a very short time only. Alice has been creating high quality PLR for her satisfied customers since 2006, so you know you're in good hands. P.S. Remember fast action takers get the best price. Grab this bundle quickly and you'll get the complete bundle that you can use to grow your list or even create a product from, if you prefer. That’s a total no brainer if you ask me. Yesterday, I told you about Alice's “Instagram and Facebook Story Profits” list building package with private label rights. If you grabbed it already, you definitely want to pay attention to this. And if you don't have it yet, get it now https://www.diyplr.com/bundles/aff/go/XXXX/?i=394 so you can put these ideas to use. Just do it quickly because the special offer ends soon. As I mentioned yesterday, the package comes with everything you need to build your list while helping your readers become better social media marketers. Well, here are some ideas about what you can do with the content. Use it as a high-target lead magnet to grow your list. If you're looking to teach your readers how to market their businesses better using social media, you've got everything you need here. Start off with offering one of the reports or articles and provide even more value with the rest of the materials or use them as an upsell. Turn it into a paid product. There's a ton of great content here for you to turn this content into a paid course. Easily charge admission for this high value, action-oriented content about social media stories. Break it up into blog posts or other bite-sized content. You've got a ton of content here you can easily turn into informative blog posts or a blog post series. Use the report or articles as opt-in offers or high-value free downloads from within your existing content. Share it on Social Media. We make it easy for you to share this valuable content on social media. Take tips from the report or articles and create your own social media graphics. Add it as a “starter kit” in your membership site. Have a membership site and want to bump of the content value? Add this content as a “starter kit” for your newbie members and they'll immediately see the value of the membership. Just remember, the special offer ends soon. Get there quickly to get the BEST deal. So if you haven't checked out the “Instagram and Facebook Story Profits” list building package offer at ListMagnets, I suggest you check it out now. They make it super easy to plan out your content. You can grab this complete package, which comes with a report, articles, ecover graphics, resources lists, landing page and more. Tons of great content for you to share with your audience! Happy Saturday to you, [name]. I've got something to share with you that will make it even better for you. Plus, you can edit the content…brand it, monetize and publish it how you want. Alice has done all the work for you. You just gotta run with it. Get your affiliates to promote it, using their affiliate link. Provide useful commentary on blogs and news sites. Include a link to your opt-in page in the appropriate space. You get the 50% Off VIP discount on the Front end AND the first Upsell when you use Coupon: StoryProfits50 . Stats show it takes over 10,000 hours to be an expert at anything. Other stats show you just have to know 10% more than any average person to be an expert on a topic. Sounds daunting doesn't it? No worries because you can actually position yourself as an instant authority on social media with my friend Alice Seba's latest private label rights bundle called: “Instagram and Facebook Story Profits”. 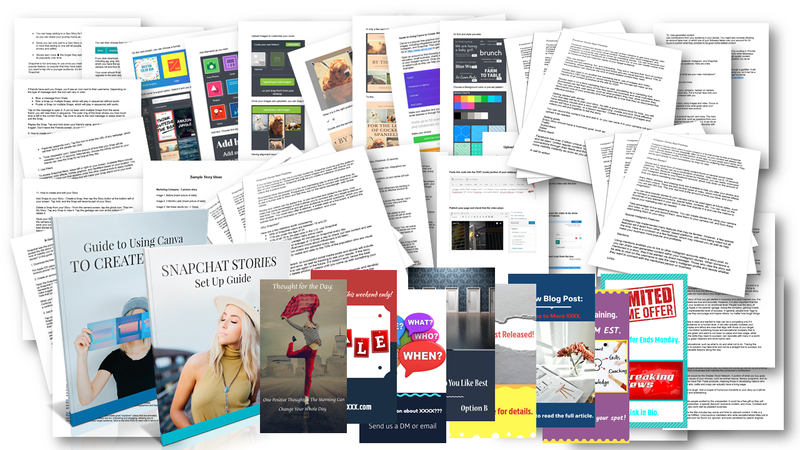 This bundle has everything you need to create products, webinars, emails, lead magnets, reports and more…already done for you…free for you to use how you choose. You get the 50% Off VIP discount on the Front end AND the first Upsell when you use Coupon: StoryProfits50. One of the best ways to reach your audience and grow your reach is through social media. There are so many creative ways to build your brand awareness and using social media stories is one of the hottest. Well my favorite private label rights content provider, Alice Seba, has made it easy for you to cash in on this. She's just released her “Instagram and Facebook Story Profits” that includes a ton of great content all about using social media stories…the right way for business. And you can grab it all at one low price, but for a very short time only. P.S. Remember fast action takers get the best price. Grab this bundle quickly. Just wanted to give you a quick note that the offer for the”Instagram and Facebook Story Profits” list building package you can brand, monetize and publish expires tonight. If you haven't grabbed it yet, do so now. If you wait, you'll be paying nearly 2x as much. It's getting late, but I wanted to make sure you didn't miss the “Instagram & Facebook Story Profits” list building package. The offer expires in just a few hours and I'd hate for you to have to pay full price.